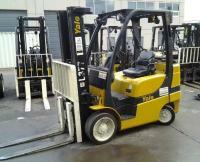 We offer forklifts and more for rent at Harding Forklift Services Ltd. Whether you need additional heavy machinery for one day or several months, you can find competitive rates on all of our material handling equipment. As an added bonus, we'll bring your rental right to you through our reliable delivery service. We even provide complete rental fleet services to keep your lift trucks running at their peak performance. Whether you're looking for a short- or long-term forklift rental, we'll get you what you need to move your business forward. Contact us today to find the rental equipment you're looking for. The ideal option for a packed warehouse, narrow aisle forklifts provide the small stature without sacrificing on power. Learn more about daily, weekly, or monthly rental options. Transport and stack more pallet loads with greater efficiency in a Yale or Utilev pallet mover. Check out our competitive long-term rental rates and reliable delivery options. 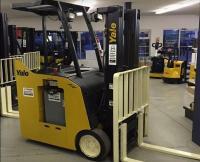 Reduce noise and emissions and increase manueverability in an electric forklift from Yale. Learn more about our competitive daily, weekly, or monthly rental rates. When you need more rugged power for the warehouse or construction site, opt for an internal combustion forklift. Discover special fleet rates for short- or long-term rentals. Whether you need a forklift for a week or a year, we've got you covered. Learn more about our short- and long-term rental rates for your fleet. When you rent from us, we'll make the process as seamless as possible. Contact us to learn about our trusted equipment delivery service.